Marlon Devonish has endured his longest year ever on the track to date, but admitted next year will be even longer as he bids to become Britain’s top sprinter. The 33-year-old began his 2009 campaign as early as April and after claiming 4x100m relay bronze at the World Championships in August carried on competing until the end of September. Devonish ended the season ranked fifth in both the 100m and 200m British rankings behind the ever-present Dwain Chambers, Simeon Williamson and Toby Sandeman, but has grand plans for the next 12 months. The Langley sprinter was the top British finisher in the 200m at the World Championships in Berlin and Devonish believes he has plenty left in his legs to ensure that is the case in 100m as well. 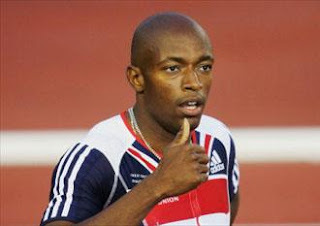 “It is great to have a medal to show for my season but I really want to prioritise the individual 100m and 200m next year,” said Devonish, who hasn’t lowered his 200m personal best since 2002 and 100m since 2007. “As ever a lot of my work recently has focused on the 200m but I still consider myself capable of running very quick 100m times. “It’s been my longest year to date. I started in April and I went right through to the last event of the year which was in Korea about two weeks ago. Devonish will again jet off to America at the turn of the year to hone his preparations for both the European Championships in July and the Commonwealth Games in October. The veteran sprinter, who trains at Thames Valley Athletics Centre in Eton, has eight major relay medals compared to just four individually in a senior sprinting career spanning nearly 15 years. Devonish last climbed the podium individually at the European Championships in 2006 after scooping 200m bronze and believes more time across the Atlantic will see him break that duck. “I want to stay out in America for longer than I did this year. I missed out on some key parts in my training because I came back a little bit too early,” added Devonish, who revealed in the summer that he will carry on until 2012. “And that had an effect and I had some ups and downs. I ran really well up to Berlin and ran really well in the relay but then I had a few injuries and little niggles.